This event is organized by Women Helping Battered Women (www.whbw.org), and I would guess that the proceeds go towards funding that organization. I had forgotten about this one until the day before, when a customer at work mentioned it in passing. One advantage of leaving Starbucks is having Saturdays off, so I made quick plans to run in the event. I never suspected that I would score a sweet new personal record in the process! The waterfront is on the western side of Burlington, Vermont. It’s where Lake Champlain separates us from New York. 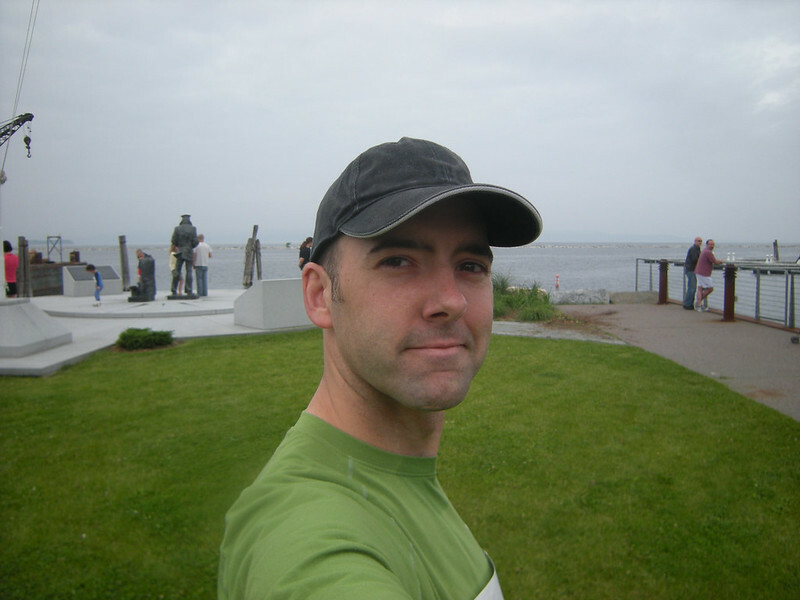 There’s a paved trail which runs up the coast, and you can usually find plenty of people running, rollerblading, bicycling, or just walking. There are a couple of parks and even a beach which can be found along the trail. 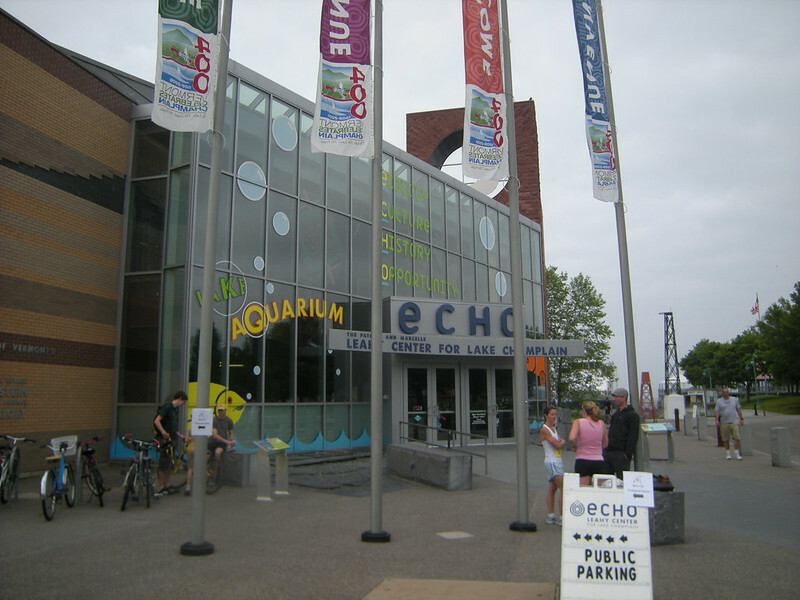 This event was officially located at the Echo Aquarium, but it was actually a little more spread out than that. The Registration Table was behind the building, but the Starting line was in front of the aquarium along the bike trail. It was a simple out-and-back type of race, with turn-around points for 5K and 10K runners. According to Google, the Starting Line is 1.1 miles from my apartment. It seemed kind of crazy to take the car and I didn’t want to tie the bicycle up anywhere, so I just ran/walked there and called it a warm-up. Battery Street is actually on my normal downtown running route, so I was pretty familiar with the landscape. There was the usual assortment of people for a small race. Baby strollers, energetic kids and runners of various ages. There were only 150 t-shirts available, so only the first folks to register got one. Apparently the organizers didn’t expect such a big response from the folks around town. They ran about ten minutes late on the Start because they were still registering people. It was okay, though. When you’re doing a fundraiser, this is the kind of problem you want to have. This event featured a kid’s race. I really dig these, regardless of the sport. Nobody really knows what they’re supposed to be doing. Small children in Tae Kwon Do gear are especially funny because they can barely move in all that stuff. For runners, the humor comes in the form of nervous energy. Nobody can stand still, and absolutely no one is capable of keeping their feet behind the line. I wonder if they all thought they were supposed to stand on the line rather than behind it? I guess it doesn’t matter. They’ll figure it all out eventually. None of the children stayed behind the line. None of them. 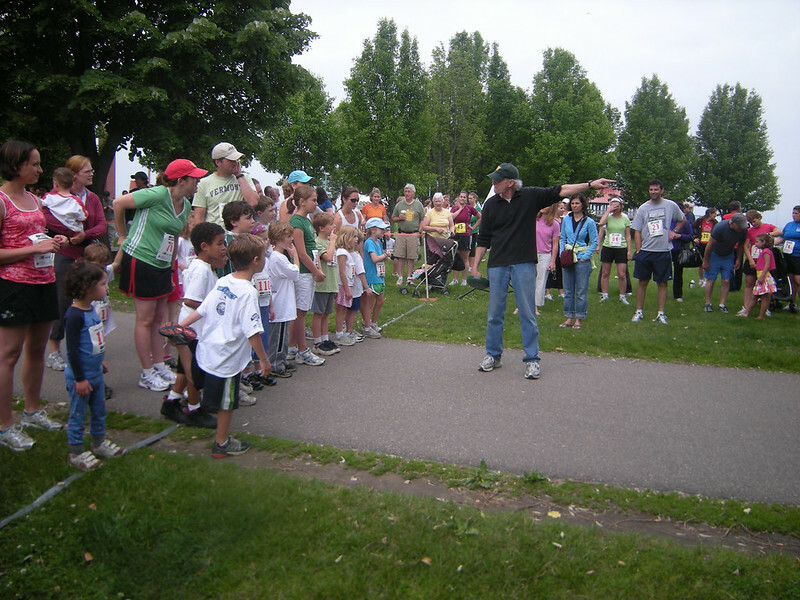 In the first photo below, a race volunteer addresses the crowd in a soft, less-than-booming voice. This is fine when addressing twenty adults who want to hear what you’re saying. Unfortunately, it’s not very effective with a crowd of fidgeting children. I pretty sure that they didn’t hear a word this guy said. They just took off and ran until they found a volunteer a half-kilometer up the trail. Take a look at the third photo, though. The kid who won build up a pretty impressive lead on the other kids. His folks should put him on a team or something. Things were pretty standard from this point on. I heard a few people speaking French, but aside from that I almost felt like I was back in Charleston. Everyone was friendly and ready to go. We received our own briefing on our turn-around points, but fortunately the guy with the bell had managed to get his hands on the bullhorn. This crowd seemed to be made up of mostly fun-runners. I didn’t see many people take off like a rocket. The second-place 5K winner, for instance, had a final time of twenty minutes and change. I would expect the top three placers to be well under twenty minutes in a 5K race. Every race is a little different, of course. Some are just more laid back than others. For instance, I once placed third in my age group at the Laura Griffin Run, but I could never have done that at the Reindeer Run. It just depends upon the crowd. I was glad for my previous experience during this event. The 5K and 10K runners were all jumbled together. We weren’t separated until we reached the 5K turn-around point. This means that it’s very unwise to pace by anyone else in the first 2.5km. The 5K runners are going to set a much faster pace than the 10K folks. A different distance requires a different plan. I pretty much stuck to my own pace and ignored everyone else’s speed until I got past the 5K turn-around point. The bike trail has a very slight incline, so we were going uphill for the first half of the race. I’ve been training on some pretty steep hills lately, so this wasn’t a problem for me. I was able to pace pretty much the way I wanted to. Slower on the first half-mile, medium for the next few, and then gradually faster on the last mile. I ran across the line at a full sprint, with my usual shout of exertion. The man who had run the Starting Bell told me that my time was 47:48. I didn’t realize this at the time, but this is a Personal Record for me. My previous record was 49:49. I’ve dropped two minutes and one second from my personal best 10K time! I hadn’t even checked the numbers ahead of time because I thought I was out of shape for a 10K run. I’ve just been doing 5K drill lately, but I guess the steep hills have paid off! We were given popsicle sticks as we finished. They had numbers written on them, and we turned them in along with the lower portion of our race numbers. Mine was 142, but keep in mind that this also includes the people who ran the 5K event. We weren’t separated until the sticks were collected. I spoke to some people, turned in my stick and went for the snacks. They ran out of water since they had more people than expected, but they were pretty quick about getting more. 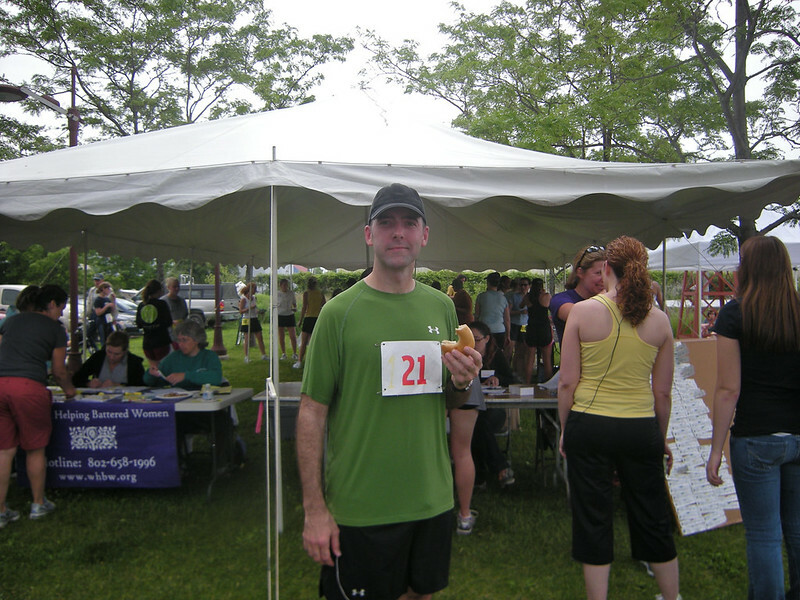 In the end, I had my bagel, my water, and a pretty good Finishing Time. I got my bagel and I was happy. I hope this one takes off. The Waterfront is easy to reach and very pretty. The organizers did very well, even with a larger crowd. I’ll definitely be back next year.